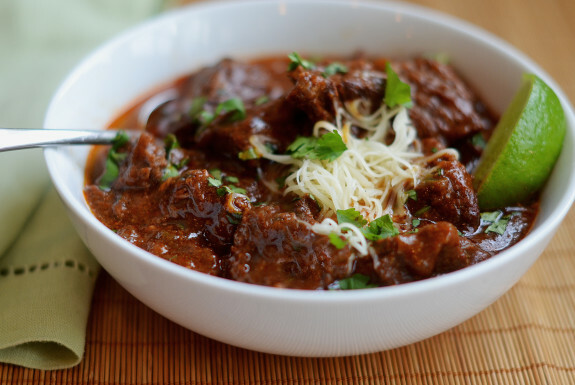 Chili is a delicious satisfying meal, perfect for an Autumn Football Sunday. Here are four of our favorite chili recipes. All of these can be done on the stove top or can be started in a pot on the stove top and moved to a slow cooker on low setting, or to keep warm, to enjoy later in the day or throughout the whole game! This recipe can be made with ground beef or turkey. Please note you can use any chili seasoning you prefer in any of these recipes to make it to your liking! In a Dutch oven or large pot heat the oil and on medium heat sauté the onions, peppers and carrots until they are soft. Add salt, pepper, cumin and chili powder and stir. Warm up the seasoning to bring out the flavors. Add ground beef, raise heat and brown. Stir in tomatoes, chili and Adobe sauce. Lower heat. Simmer for 30 minutes. Add beans and cook 20 more minutes in low heat. Serve with grated cheddar and a dollop of sour cream. In a Dutch Oven or large pot heat the olive oil. Sauté the onions and peppers until the onions start to become translucent, add the garlic and continue to sauté to soften the garlic. Stir in the seasoning. Let the seasoning warm up. Stir in the broth, lentils and tomatoes. Bring to a boil and reduce heat. Stir again, and let it simmer partially covered on low heat for about 45 minutes. You can garnish it with cilantro. In a Dutch Oven or large pot heat the olive oil. Season the chicken with salt and pepper and lay it skin side down in the hot oil to brown. Brown both sides of the chicken and transfer to a plate. Add more oil if needed and sauté the onions for a couple of minutes, add the garlic and sauté. Add the chiles and cumin and stir to warm up the seasoning. Add the chicken broth. Place the chicken back in the pot. 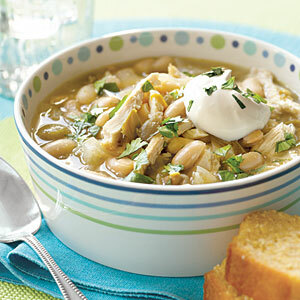 Bring to a boil and reduce to a simmer, add the white beans and simmer partially covered until the chicken is cooked through, about 1 hour. Remove the chicken. Take the skin and bone off the chicken breast and discard. Shred the chicken. To thicken the soup you can use a hand blender to partially blend some. 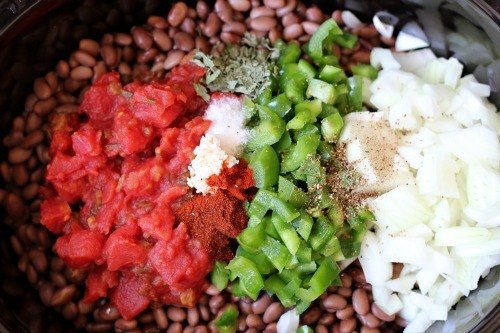 Or you can remove about 1 cup of beans and 1 cup of brother and thicken it in a blender, then add it back to the pot. Add the chicken back to the pot and serve. We like to garnish with sour cream and chives. Heat a Dutch Oven or large pot and brown the bacon. While the bacon is browning, in a pie plate add the flour and some salt and pepper and toss the sirloin to coat. Remove the browned bacon and set aside. Shake of the excess flour on the sirloin and brown the sirloin in the bacon fat. Remove the sirloin, sauté the onions, peppes and jalapeño for about 3 minutes, and the garlic. Add the chili powder and cumin and stir. Add the sirloin back to the pot and pour the beer, beef stock and tomatoes. Bring to a boil reduce to a simmer and simmer on low heat partially covered for about 1 hour. Stir in beans and simmer for 15 more minutes. Serve garnished with crumble down bacon, cheddar cheese, sour cream and scallions. « Easy Fourth of July Recipes and Ideas-incase you didn’t see this last year- here it is again just in time for the 4th! 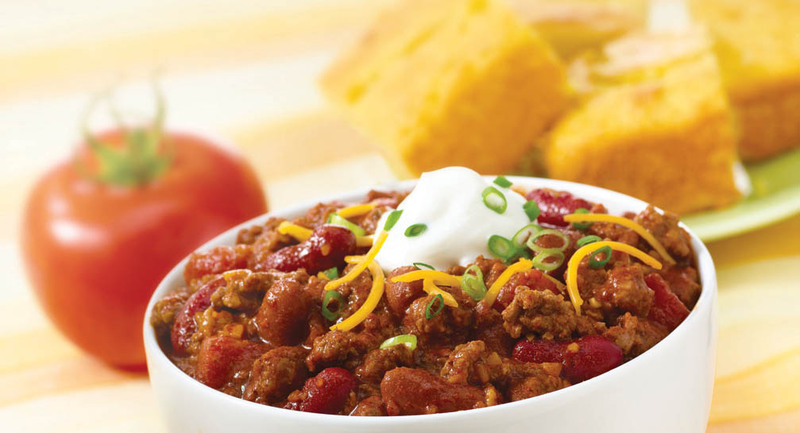 These chili recipes look delicious. Can’t wait to try them!